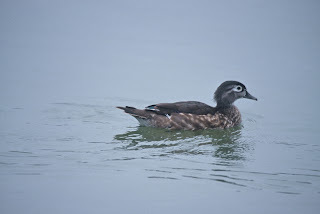 OC Birder Girl: Wood Duck or Mandarin Duck? Notice that the pictures are very similar, but not the same. In my post A Walk in Huntington Central Park West 10/15/2007 , I identified a small duck I had seen on my walk as a female Wood Duck. 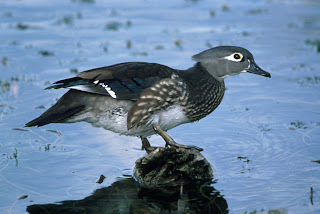 However, there were small differences between the pictures that I had studied of female Wood Ducks and this cute little bird. And it bothered me. Actually, the differences started nagging at me. I began to look for other ducks that looked like this bird from the park. I looked at lots of pictures and videos. Look at some with me. 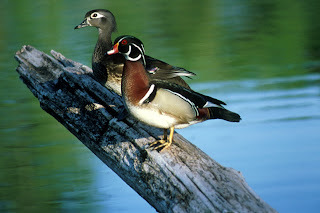 Notice in each photo of the female Wood Duck that white surrounds the eye. It is almost like the eye is set in a large, white tear drop. However, if you look at my picture, that is not the case. The little female in my picture has a very thin white line around the eye and a thin line going toward the back of her head like spectacles. The crest is shaggier and more prominent. The coloring looks different in different light, but is very similar. Most of the markings are very close, but not exact. Pictures. Good article on telling ducks in general apart. You have to page down to see the female Wood Duck. Good article on telling one species from the other. A good comparison of females that gets right to the heart of differentiating these two ducks. Video that shows the difference. Especially the last shot. Stick around for the whole video. Now, let's take a look at my duck again. 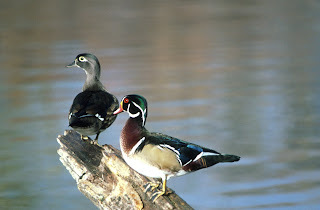 Note the similarities and differences between my picture and the female Wood Duck and my picture and the Mandarin Duck. When I first looked at both ducks, they seemed to be almost exactly the same. But once I looked at a lot of pictures and videos, it became to easier to recognize that they are two separate species. Watch the video below. In this video, you can also hear the duck from Central Park call as she stands behind the male Mallard Duck. The call is a bit sudden and explosive like a whistled sneeze or cough. Now, I think it is obvious that this female duck is a Mandarin Duck and not a Wood Duck. So, how did I make such a mistake? Well, first of all, I am human. All birders on occasion make mistakes--even experts--which I am not. Second, I made an assumption that I knew what the bird was without really observing it. It wasn't observation, but assumption that guided my identification. I had heard that there was a female Wood Duck at Huntington Lake in Central Park, and I assumed other birders knew better than I did. I was lazy. And I assumed that this was the bird I had heard about. So either the other birders were wrong, or this was not the bird they saw. Always observe the bird you see, and not the bird you think you should see. Hold off for a few minutes jumping to an identification and observe what you are seeing. Note the markings and behavior , the size, sounds it makes, and its color. Then after noting all the characteristics you are seeing, make a hypothesis. Guess. Look it up and see if it matches what you saw. Are there differences in appearance, sound, or behavior? What are the differences? And finally could this be any other bird? After comparing and accounting for differences, make an identification. So, the lesson I learned was observe, observe, and then observe some more. Go thou, and do likewise. Search for books, DVDs, binoculars, digital cameras and more at Amazon.com.